George E. Peterson IV: Panels 2 & 3 of "Army of One"
Panels 2 & 3 of "Army of One"
I have been looking at Daniel Richters paintings that include menacing dogs. This was an idea that I had been considering, but I felt that I needed to paint through differnet stages before allowing myself to paint animals, it seemed arbitrary. Richters dogs seemed very menacing and were at the disposal of menacing looking figures, that appear to be members of SWAT or something. While I had no interest in that type of subject matter, I found it interesting to include the wild appearance of one (or several) within the same scene as a human. I thought there was even a more signifcant way to do so. 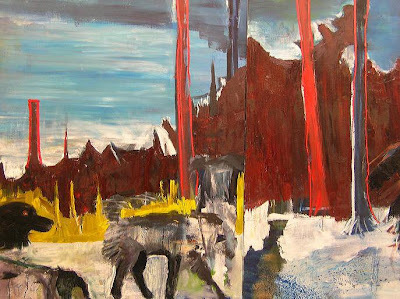 Panel 1 of "Swampland Observatory"
Detail of Dogs with "Army of One"